Ensuring safety is a primary goal in physical human-robot interaction. In various collision experiments it was found that the robot’s effective mass, velocity, and geometry are the key parameters which influence the human injury severity during an impact. Recently, a velocity controller was proposed that limits the robot speed to a biomechanically safe value, taking into account the mass and the curvature in the direction of movement for a given point of interest. The mass and the geometry depend on the mechanical design, however, the effective mass also depends on the robot configuration. 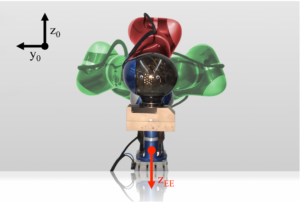 In this paper, we exploit the redundant degree(s) of freedom of a joint torque controlled seven- and eight-DOF robot to minimize the effective mass without affecting the desired Cartesian end-effector trajectory and with the goal to improve the performance of the safe velocity controller at the same time. Given recent results in robotics injury analysis, we analyze when such a redundancy resolution scheme actually improves safety. For the considered robots, we find reflected mass extrema that can be obtained by null space motions, and propose a real-time, torque-based redundancy resolution scheme, which is finally verified in experiments.